A former Air Force Academy cadet who claims he was ordered to break cadet policy while working as a confidential informant and then expelled for doing what he was told has exposed the scope of the Office of Special Investigations’ use of informants to spy on their fellow airmen. 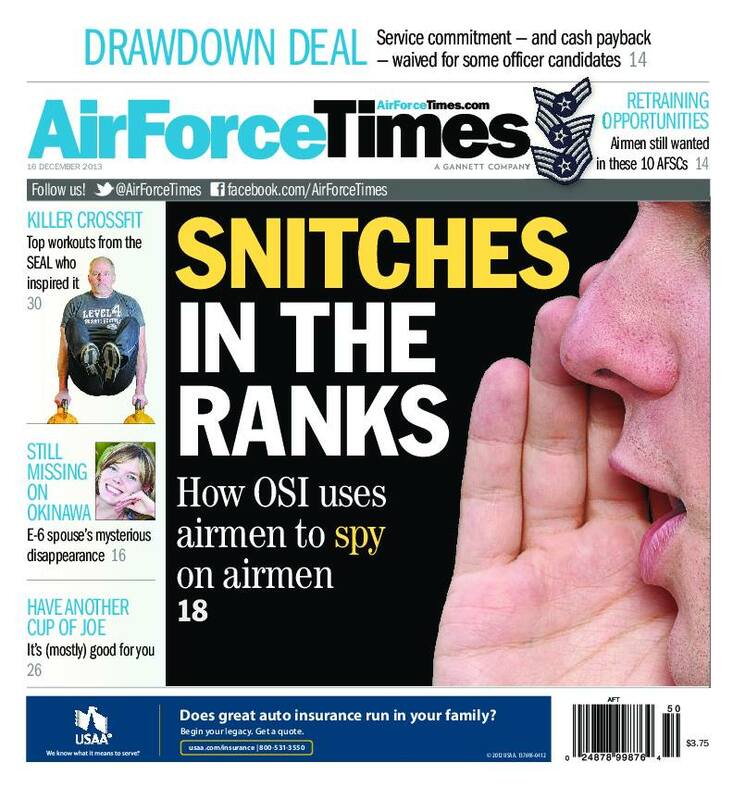 In this week’s Air Force Times, you can read how this cadet was recruited to work for OSI and what happens to airmen after they become confidential informants. Also this week: It’s been two years since Air Force wife Kelli Abad disappeared from Kadena Air Base, Japan, but her mother refused to give up hope. Janice Cribbs explains why she refuses to believe that her daughter committed suicide, as investigators believe. Meanwhile, the Air Force is making due with less money by turning toward simulators as a low-cost alternative to training flights. Air Force Times has the five things you need to know the uptick in simulator training. In other news, Ramstein Air Base is mourning the loss of Airman 1st Class Jonathan Santos-Carvajal, who was killed in a Dec. 4 car crash. And only 243 retraining slots remain for first-term airmen. The Air Force has reduced retraining opportunities for 710 airmen in 44 specialties due to budget cuts.